The 1842 Mississippi Governor’s Mansion is the second-oldest continuously occupied governor’s residence in the United States. 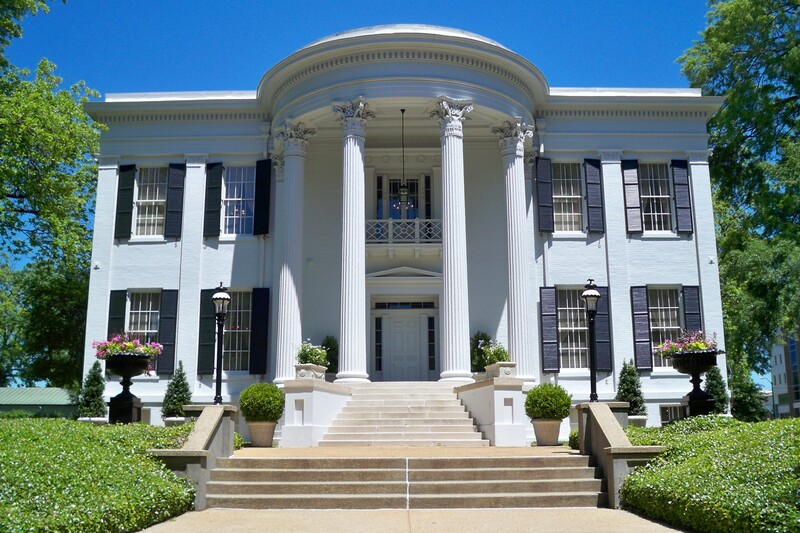 Designed by English-born architect William Nichols, who also designed the 1839 Mississippi Capitol, the mansion is an outstanding example of domestic Greek Revival architecture. The 334 BC choragic monument of Lysicrates in Athens was the basis for Nichols’s design of the mansion’s semicircular front portico supported by Corinthian columns. Nichols designed ornately carved architraves with the anthemion (Greek honeysuckle) for the large entrances, with pocket doors between the dining room and the east parlor and between the double west parlors, as well as for the front door and doors of first-floor rooms. These architraves were patterned after engravings published in Minard Lafever’s The Beauties of Modern Architecture (1839). Lafever’s publication was also the source for Nichols’s rosette design for the carved wooden mantels in the west bedrooms, two of the four original second-floor bedrooms. During the Civil War, Gov. John Jones Pettus ordered the removal of most of the mansion’s furniture, which was shipped to Macon, the temporary state capital, for safekeeping. At the war’s end, however, this furniture—undoubtedly some of the mansion’s finest—could not be located. Wounded Confederate soldiers were housed in the mansion after the first Union occupation of Jackson ended in May 1863. Federal troops returned to the city and on 18 July, Gen. William Tecumseh Sherman celebrated the fall of Vicksburg with a victory dinner at the mansion. The mansion survived the war but subsequently suffered neglect and fell into disrepair. By 1904 many citizens were calling for its demolition, and the legislature considered disposing of the mansion to make room for commercial development. After his January 1908 inauguration, Gov. Edmond Noel announced that because of the structure’s poor condition, he and his family would reside at the Edwards House. Patriotic women’s organizations and other groups urged that the mansion be saved, and in March 1908 the legislature allocated thirty thousand dollars for a renovation, which was to be directed by local architect William S. Hull. The 1908–9 renovation included the construction of a two-story family annex to the rear of mansion. Selected windows on the rear facade were bricked in, and the original twelve-pane windows were replaced with the more modern one-over-one style. The original staircase was removed and replaced with a center staircase to give access to the family annex. New entrances from the back hall to the dining room and from the back hall to the northwest parlor were constructed to match the 1842 entrances in both size and form. The original front door was replaced with a beveled glass door. Thin hardwood floors were placed over the original wide heart pine plank floors. A layer of yellow pressed brick was applied to the original mansion exterior to match the yellow pressed brick of the family annex. The mansion remained yellow until it was painted white during the 1940–43 term of Gov. Paul B. Johnson Sr. Despite occasional appropriations for repair and furnishings, the mansion deteriorated structurally until a 1971 inspection indicated that the building was no longer safe for occupancy. Gov. John Bell Williams and his family moved out, and the mansion’s future again looked bleak. During the 1971 gubernatorial campaign, candidate William Waller and his wife, Carroll, recommended a complete restoration of the mansion, as did the Mississippi Department of Archives and History. Public support for preservation grew, and shortly after Waller’s January 1972 inauguration as governor, the legislature allocated $2.7 million for a major restoration and renovation between 1972 and 1975. The State Building Commission appointed Charlotte Capers, who had served as director of the Department of Archives and History during the restoration of the Old Capitol and who now held the post of director of publications and special projects for the department, to serve as principal executive for the mansion project. Consultants on the project included architectural historian Charles E. Peterson, noted for his work on Independence Hall and the Historic American Buildings Survey, and architect and interior designer Edward Vason Jones, who had worked on the White House and the US State Department Diplomatic Reception Rooms. Investigation of the house and historical records led to discoveries such as the location of the original staircase. Sliding doors that had been encased in walls were uncovered. The hardwood flooring was removed to expose the original wide heart pine plank floor. A geometric painted border was found on the original floor in the double west parlors. Jones oversaw the acquisition of museum-quality furnishings that would be compatible with the mansion’s Greek Revival style. Carroll Waller spearheaded fund-raising to match a twenty-thousand-dollar grant from the Mississippi American Revolution Bicentennial Commission. In 1975 landscape architect William Garbo designed formal gardens with walkways, benches, two gazebos, and a columned fountain. Around a rose garden was placed a miniature replica of the cast iron fence that had surrounded the perimeter of the mansion grounds from 1855 to 1909. On 24 April 1975 the National Park Service designated the Governor’s Mansion a National Historic Landmark. On 8 June a formal dedication ceremony was held and the mansion again opened its doors to the public. In 1980 the legislature gave the Mississippi Department of Archives and History authority over the use of the historic section and grounds of the Governor’s Mansion. The building still serves as the residence for the state’s chief executive, while the 1842 section is open for free guided tours, meaning that the mansion welcomes visitors from schoolchildren to tourists to dignitaries from the United States and abroad.